Hope all of you are doing great 😊 Today, I will be reviewing my current favourite red lipstick from the brand Colorbar. 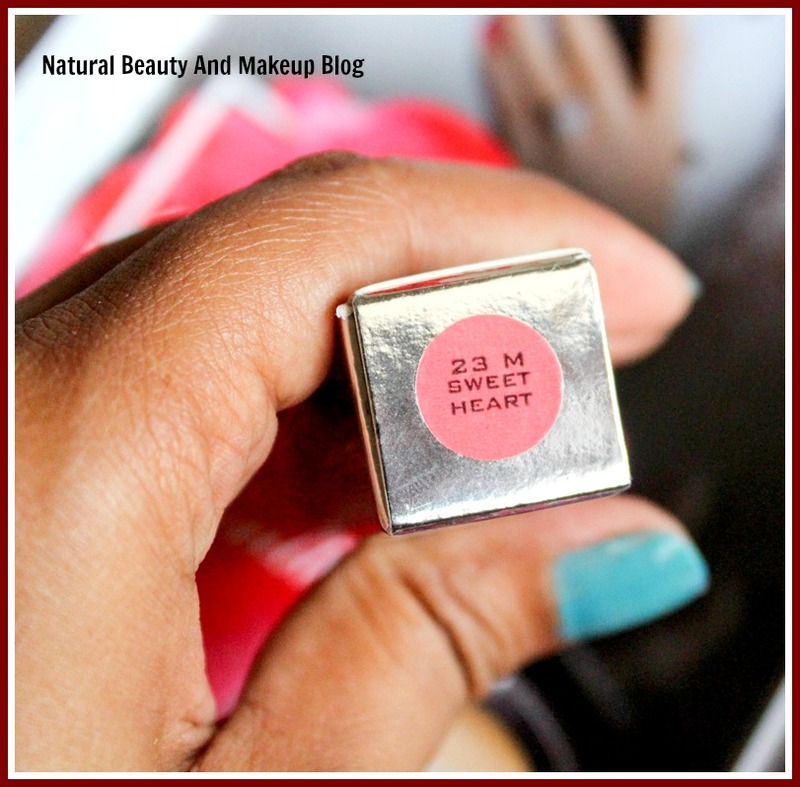 The shade name/number is Sweetheart 023M and it belongs to Matte Touch range of Colorbar lipsticks. To know more about this product, keep scrolling! It features the glamorous properties of a matte lipstick with a velvety finish which will make you fall in love. This amazing lipstick has an intense colour that is creamy, soft and glides smoothly on application simply moisturising and incredibly wearable yet absolutely matt. 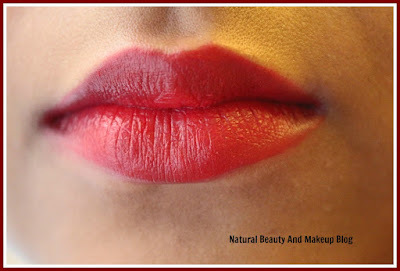 Application: Line the lips with a suitable lip liner. Press the bullet to the lips using even pressure to apply colour on both upper and lower lips: To refresh and even out, press lips together. Using a lip brush gives a richer and more precise colour application. Colorbar Matte Touch (Sweetheart 23M) lipstick comes housed in a small silver carton where the shade name and brand details are mentioned. Inside the carton, the lipstick comes encased in a classy, metallic packaging whose cap shuts tight, making it extremely convenient to carry around. The shade name is labelled at the bottom of the lipstick, no colour coding. So if you have a lot of lipsticks from the same range, it will be difficult to find it out, especially when you are in a rush! Sweet Heart 23M shade is a cool toned, true red shade. 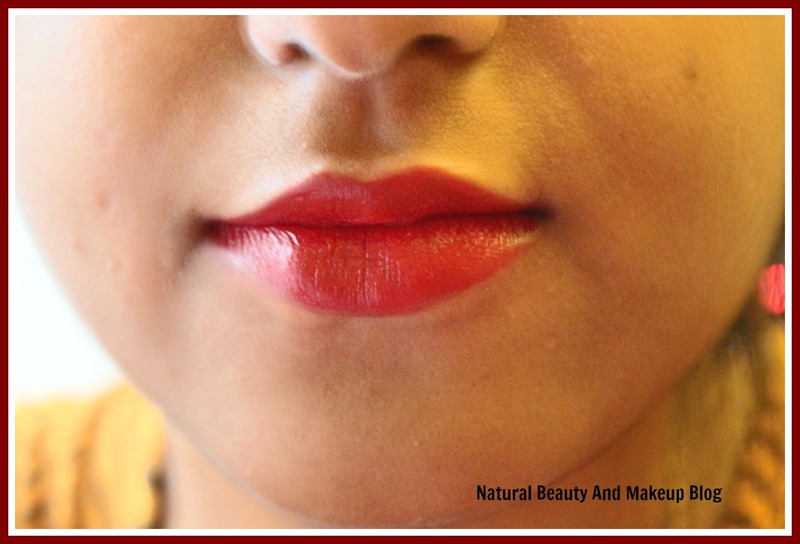 The texture is quite creamy, smooth and glides evenly on the lips providing a semi-matte finish to the lips. Oh! It is insanely pigmented 😍 So much that it's one swipe is enough to give your lips that opaque, deep red colour. But I prefer to layer it twice so that my lips look sultrier 😉. I am totally impressed by its staying power quality. It stayed intact on my lips for more than 6 hours!! I still remember that during my Hyderabad trip, it stayed put on my lips for the longest duration, say from 9 am to 8 pm. I had a few snacks in between and it survived! Even post dinner (all non-veg oily food) too, nothing major change I noticed, the matte finish though reduced a bit but the colour was still intact. Suffice to say, regarding staying power it is not going to disappoint you at all 😊. Well, this is my second red lipstick after Lakme but it is the only true blood red shade that I own as of now. Hence cannot comment whether this particular shade is a dupe of this or that brand. When I entered Colorbar showroom with an expectation of buying a beautiful red lipstick, SA showed me this shade and I got impressed instantly. I do have dry lips, so I need to take extra precaution prior to using this lipstick. Usually, I scrub my lips (Honey & sugar) nicely followed by applying my favourite lip balm and then lining and filling my lips with a red lipliner to keep the lipstick locked in place. 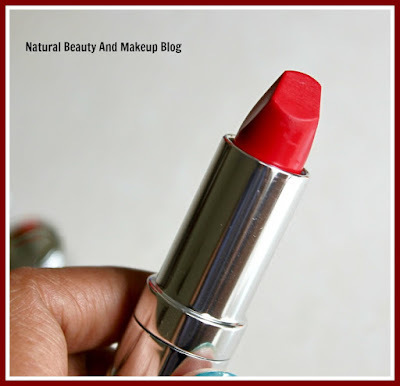 True to its website description, this is a matte lipstick with a velvety finish formula. 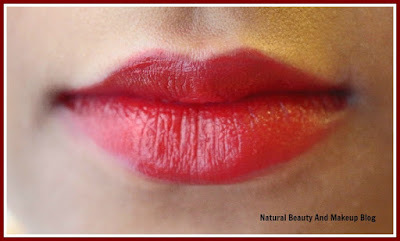 As said earlier, the texture is quite creamy and smooth hence it transfers & bleeds eventually, lining the lips is a must. Moreover, make sure to scrub and moisturise your lips prior to using it, especially if you have super dry lips as this can accentuate the dry patches otherwise. It makes quite difficult to layer post application, so try not to overdo that. 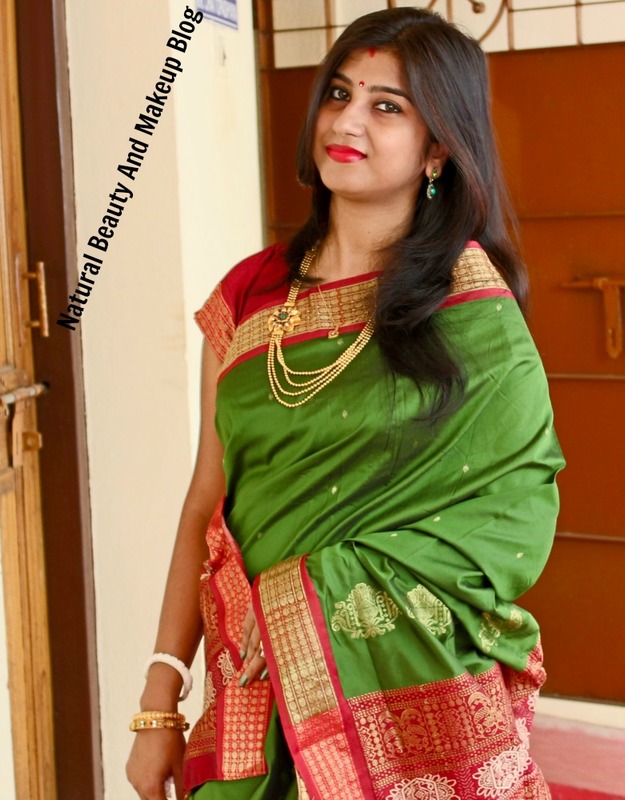 The design of the lipstick tip helps in easy application, especially around the lip corners.Once applied, it looks glossy at first but after a while, it settles into a semi-matte finish. What I do to get a proper matte look is to press a tissue paper against my lips followed by dusting some powder and again applying this lipstick. Voila, the after effect is as stunning as it gets!! Above all, this lipstick has inbuilt sun protection properties along with chemicals like Parabens and Perfumes to name a few 😒. But I apply lipsticks occasionally, so I am not bothered of its ingredients that much. The best part, its lightweight texture doesn't feel heavy on the lips, which I find impeccable. You can wear this lipstick anytime, day or night, either way, it looks amazing always 😊😊. 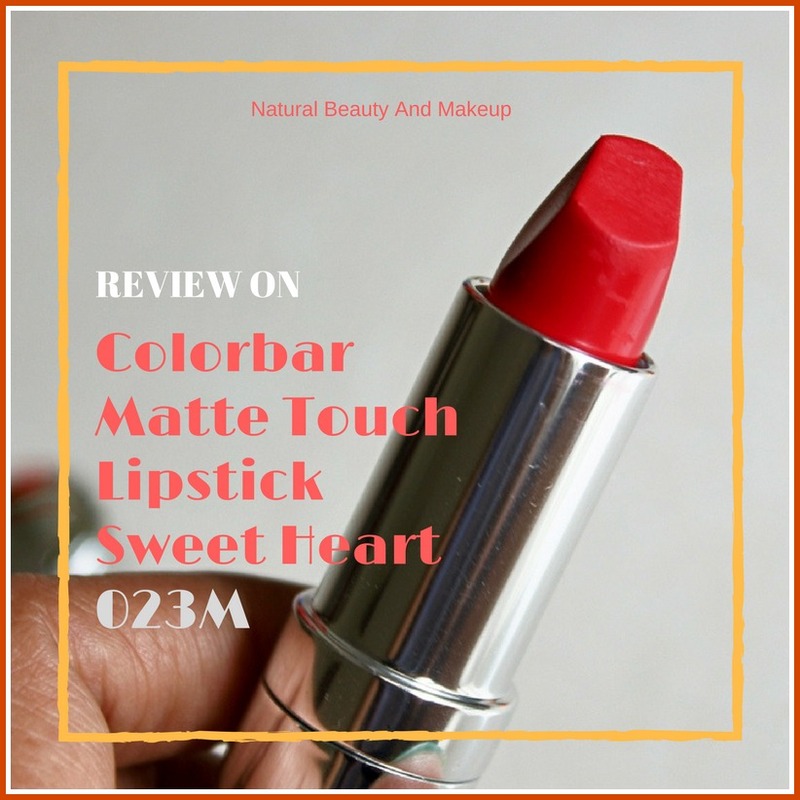 Colorbar Matte Touch Sweetheart lipstick is a gorgeous cool toned red lipstick and I believe it'll flatter every skin tone. We all are aware of the disadvantages of a matte lipstick, likewise, this too has a tendency towards flaking and drying out the lips but it can be minimised by exfoliating & moisturising the lips easily. 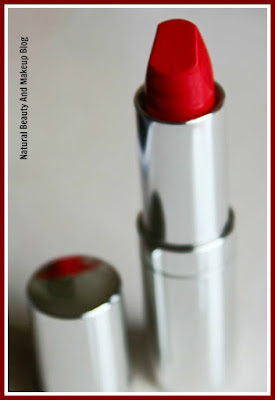 In a nutshell, I am loving this lightweight red lipstick to bits and that’s the reason I flaunt it every now and then 😍 If you are looking for a semi-matte red lipstick which is an absolute value for money, you can give this a try certainly 👍. Hope you find my review helpful. Have You Ever Tried Colorbar Matte Touch Sweetheart 023M Lipstick Yet? If Yes, Please Do Share Your Experience With Me In The Comment Section Below. The shade is gorgeous, I have used a lipstick from this range, its really good. I love red alert dear..and you are looking beautiful in this shade...but now a days I am.only into completenon transferable matte...😍😍...hey Ana...have you seen that Blue Heaven has come come up with some completely non traferable matte liquid lipstick...which costs only INR 205!! !..and I saw the swatches and review..they are amazing..I am.surely gonna pick up...they look amazing.. 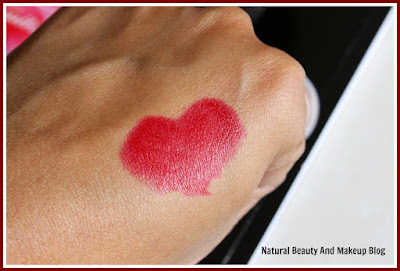 Thank you so much Claire for your lovely comment <3 Yeah,it's very hard to find a non-chemical lipstick nowadays!! Great post, amazing items as well, the pictures are stunning, I love your blog. Thank you for sharing, you look gorgeous!!! The shade is gorgeous and suits you amazingly, too bad that it flakes. 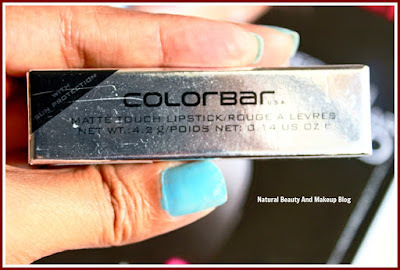 Been a long time since I tried colorbar lippies. This one though not a red as such it does look really pretty on you.